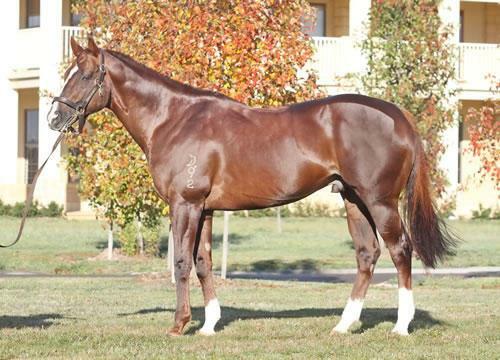 WRITTEN TYCOON (AUS) (Chestnut 2002-Stud 2007). 2 wins at 2, STC Todman Slipper Trial S., Gr.2. Leading Aust. Sire of 2YOs 2015-16. Sire of 377 rnrs, 266 wnrs, 18 SW, inc. (La) Luna Rossa (Manawatu Sires' Produce S., Gr.1), Capitalist, Music Magnate, Howmuchdoyouloveme, Tycoon Tara, Rich Enuff, Winning Rupert, Written Dash, Trump, Vibrant Rouge, It is Written, Grand Tycoon, Hot Dipped, Stoker, Super Cash, Shakespearean Lass, Written Up, etc. STREET DARLING, by Street Cry. 2 wins at 1400m, 1800m in Aust. Half-sister to Stralia - Lucky Double Eight (H.K. ), Mr President. Dam of four foals, two to race. Stralia - Lucky Double Eight (H.K.) (Stratum). 2 wins at 2, A$125,000, HK$2,628,250, VRC Victorian Carbine Club 2YO P., Blackwoods 2YO P., 2d VRC Danehill S., Gr.2, Hong Kong Rugby Football Union Cup, HKJC Ireland Trophy H., Yuen Long H., 3d HKJC Panasonic Cup, Acclaim H., Big Wave Bay H., High Autonomy H., Golden Jubilee Cup. Mr President (Xaar). 4 wins from 1200m to 1600m, A$142,025, WATC Hubon H., Flexi Trifecta H., Ahg.com.au H., Tabform Out Now H., 2d WATC Baileys Irish Cream H., 3d WATC Challenge S., L, Aquanita S., L, Westspeed 3YO H., Highden Belle H., In Reference H., BMW 7 Series H.
Street Darling. 2 wins. See above. I'm on a Journey. Winner at 1400m in 2015-16 in Aust. Comearoundsundown (Not a Single Doubt). 5 wins-2 at 2-at 1100m, 1200m, A$152,825, SAJC Bridges Financial Services H., DHP 2YO H., Schweppes Tonic H., Distinctive Homes H., 3d SAJC HC Nitschke S., L, Dominant H.
Creativity (Master of Design). Placed at 2 in 2015-16, 3d VRC Festival of Racing S., L.
Freedom Road. 2 wins at 1350m, 1550m in 2015-16, SAJC Schweppes H., 3d SAJC Moet & Chandon P.
Winning Power - Fabulous Cake (Mac.). 5 wins-1 at 2-to 1400m, HK$2,285,800, M$497,800 in HK and Macau, HKJC Larch H., Banyan H., Tai Tam P., Kirara H., 2d Macau Chinese New Year Trophy, HKJC Sai Ying Pun P., Privilege H., Chevalier Lift & Escalator H., 3d HKJC Canberra H., Kung Hei H.
SPEND (Geiger Counter). 3 wins to 1400m, A$462,090, AJC Razor Sharp H., L, Tamworth JC Prime Television H., L, 2d STC Skyline S., Gr.3, AJC Breeders' P., L, GCTC Magic Millions 2YO Classic S., L, AJC Canon Sureshot H., Empire Link Quality 2YO H., STC Light Quality H., GCTC Magic Millions Cup, 3d AJC Brian Crowley S., L, Oneworld Circle Pacific H., City Tatt's RC Information Technology Solutions P., 4th AJC Razor Sharp H., L, STC Satellite S., L.